Combine beauty with strength with a Curb Link Bracelet. Gorgeous strands of either yellow gold, white gold and even sterling silver are created masterfully in this Curb Link category. The curb links are bold links that lay flat as they connect together across your wrist for a classic touch. 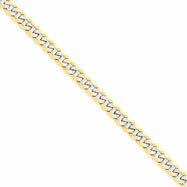 14K Gold 4.5mm Pave Curb Bracelet 8"